In the limbo world between Heaven and Earth, a fearsome demon lord readies his unholy forces for the time when the gates to the human realm will be shattered. As the prophesised hour draws near, the demon hordes hunt a beautiful angel who has the power to prevent their destiny from being fulfilled. Only a wandering human warrior (Jung Woo-sung, The Good, The Bad, The Weird), who's become trapped in Mid-Heaven, and his magical demon-killing sword stand in their way. Korean action cinema continues to flex its muscles on the world stage with this magical action epic from first-time directors Jo Dong-oh and Cho Dong-oh. Featuring some spectacular kung fu action, Demon Empire (Joong-cheon) is visually striking, whose trio of art directors include Ming Wu, whose previous films include Hero and The House of Flying Daggers. We'll have to wait and see if its substance matches its visuals – advance word suggests not, but the visuals are apparently quite something. 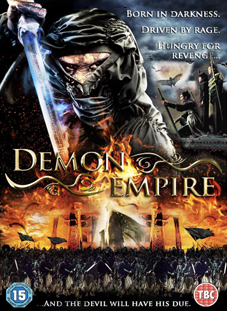 Demon Empire will be released on UK DVD from Metrodome Distribution on 28th March 2011 at the RRP of £15.99. Extra features are so far limited to a making-of featurette.